Every parent has been in the situation of fearing their child having a concussion after falling while attempting their first steps. These type of falls happen all the time, and the concerns are based on fall-related injuries leading to more severe implications. Toddlers behaviors create a higher risk for falls and injuries either when they are learning how to walk or once mastered, running and other activities that put them at risk. Preventable measures can ease parent anxiety that a traumatic brain injury could lead to a cause of death and disability in these pediatric age group. Research has shown that the most common mechanism of injury in a 5-year longitudinal study taken place at the Children’s Memorial Hospital in Chicago was head injury related. Between 0–16 years of age, the most common mechanism of injury was a fall (75.5%) with post-traumatic seizures developed more commonly in children under two years of age (15.7%) than in older children (11.6% under three years of age, 9.6%, entire group). However, not only toddlers get injuries of this kind. Sports-related activities among middle-school-aged children could result in concussions as well. Stopping a child from exploring the world due to fear is impossible. 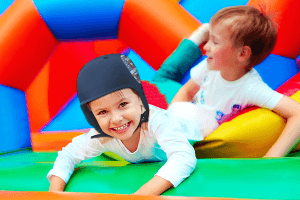 However, a preventable and accessible measure is the purchase of a soft protective helmet. 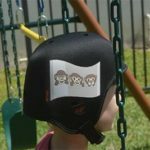 Opti-Cool Headgear© is a versatile helmet for multiple uses that come in different colors and stickers to choose from. Not only has excellent characteristics such as comfortable interior padding, but waterproof and lightweight features as well. Its moisture-wicking material and quality chin guard make it an excellent protective item for all ages. 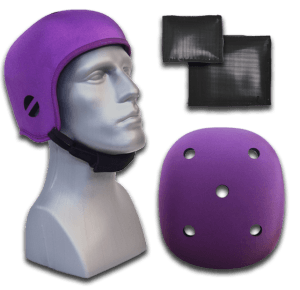 This 1/2″ thick EVA Rubber foam helmet features optional custom wrapped gel packs to cool down the head, providing relief from migraines, swelling and other injuries that need healing. If for any reason after purchasing the helmet you are not satisfied, a refund within 60-days of shipment is possible.